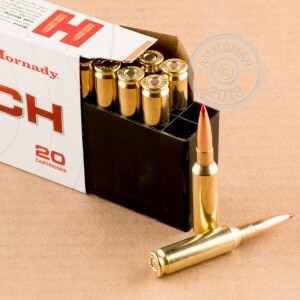 Hornady has revolutionized their match ammunition with suped-up components and testing measures that outperform the competition. 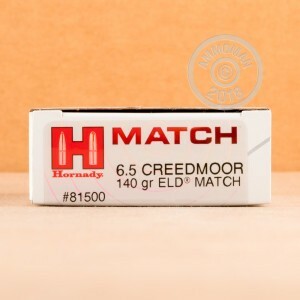 They have fitted this 6.5mm Creedmoor ammo with a 140 grain ELD (extremely low drag) Match bullet with their patented Heat Shield polymer tip. The ELD bullets are able to withstand the heat that occurs in flight at high velocities, which makes them more precise than other match bullets on the market. Each bullet is optimally balanced inside and out for consistent speed and accuracy at both short and long range. These rounds have a muzzle velocity of 2710 fps, and the Heat Shield tip ensures stable ballistic coefficients while in flight. These rounds have been assembled using new-production brass casings that are Boxer-primed and reloadable. Hornady tests their ammunition using the most innovative methods available, including their own aeroballistics software and Doppler Radar. This is a remarkable round especially if delivered from a Ruger Precision with the 5R rifling. This is a remarkable round especially if delivered from a Ruger Precision with the 5R rifling. One inch groups at 200 - 400 yds is easily acquired. A great combination together.